Yesterday, I posted a new banner for the Pisteuomen blog. The photo (taken by my wife or myself a few months ago) appears, at first glance, to be the shore of a beach or a snow-covered hill. However, it is actually a large mountain; the surface of it only resembles waves or snow. 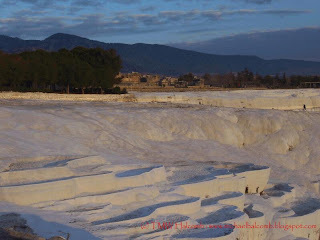 Pamukkale / Hierapolis ("Holy City") is located in Turkey near the ancient Biblical sites of Laodicea and Colossae. Leading up to Hierapolis is actually a location referred to as Nekropolis ("City of the Dead" which I may do a post on soon) that contains a great number of ancient tombs; it is quite fascinating to see. Pamukkale,though, is known in large part for its hot water springs. In fact, the hotel we stayed in at Pamukkale had its own hot water spring swimming pool (the water was quite brown and very, very hot, 89.6 *F). Anyways, back to the mountain. On the face of the mountain's surface there are a lot of calcium deposits that hold water; they look like puddles or small pools. In other words, the little dips in the mountains fill with warm water; people go swimming in them year-round (though, for some reason, that was forbidden at the time we were visiting). It seems that in Revelation, Pamukkale does get mentioned, albeit implicitly. For example, in Revelation 3.15-6, John says, "I know your deeds, that you are neither cold nor hot. I wish you were either one or the other! So, because you are lukewarm—neither hot nor cold—I am about to spit you out of my mouth." Now, cold and hot are both good things here (cold is not a bad thing, as is commonly thought). Cold water, piped into Laodicea from Colossae for instance was refreshing to the people. The warm water springs at Pamukkale were therapuetic to the body. So, John is saying, "Either be a cold (refreshing) Christian or hot (therapuetic / healing) Christian, to those around you. Do not be lukewarm (tepid) because nobody values tepid water; it is useless--do not be useless! These waters actually do heal some allergies and sicknesses. It is no wonder that in the ancient world, magicians and physicans would frequent these places to work healings. Modern doctors, though, have found that there is something in the waters that helps cure certain ailments. Actually, and many will probably think I am pretty kooky for saying this but when I was there, another woman who was on the trip with us was running and suddenly tripped. She scraped her hand up pretty good and it started bleeding. After she put her had in the waters for a moment, it was healed. Pretty crazy! Below is another picture of Pamukkale (Nekropolis is off to the left behind the trees and in the upper right corner, you can see more of the city of Hierapolis), one of my favorite places in Turkey. If you ever visit Turkey, be sure to go here, you'll regret it if you don't! I was gonna ask where the new banner was from. It's very pretty! But you're telling me that's not a body of water? You ARE kooky! Wow...unbelievable. Great pic. From Istanbul, wow, in a car maybe a day's drive. It's not far from Izmir and Ephesus, just a few hours from there by bus. It's hard for me to judge because I went everywhere on a bus which slows everything down. Sorry, not much help there but like I said, probably a day's drive. You're right, that's not a body of water, though there are tiny puddles or small pools in the dips of the mountain surface.